Cyclists are clearly using Township roads and want to make roads safer for cycling. They want to remind motorists of the 3 Foot Passing law. However, township folks are afraid that distracted motorists will… what… Look up from their phones and actually SEE the signs? Township trustees are afraid to “… draw more cyclists to the streets…” and that cyclists will develop a “FALSE SENSE OF SECURITY” from the placement of signs relative to theThree Foot Law?!?!? I’m sorry, but the Number One Priority of Elected Officials should be to INSURE that its citizens can HAVE a TRUE sense of security. Elected officials need to take steps to promote and insure that lawful roads ARE safe. I cannot understand how a sign, which they don’t even have to purchase, reminding motorists to Give 3′ While Passing Cyclists can somehow lull cyclists into a false sense of security… that makes absolutely no sense to me. Are Township Trustees are admitting that they have allowed township roads to become HAZARDOUS TO LAWFUL USERS? Instead of Hoping and Praying that people who want to use the roads stay home they choose instead to talk about ENFORCING speeding laws and ENFORCING texting laws and ENFORCING distracted driving laws? Seems like a Township that openly admits that its roads are dangerous for lawful use runs the risk of admitting negligence – of admitting roads are a nuisance – of admitting that they have chosen to allow “hazards” to users to remain. Let’s be clear. In Ohio, just about EVERY road is a BIKE ROAD – just about every road is a LAWFUL place to ride a bike. These “roads” in Granger Township are not dangerous or hazardous to cyclists. Rather, BAD DRIVERS are dangerous… Folks who drive UNLAWFULLY are dangerous… Folks who SPEED are dangerous. Folks who TEXT WHILE DRIVING are dangerous. Folks who DRIVE WHILE DISTRACTED are dangerous. As long as the Township or the County officials fail to enforce laws, ticket unlawful drivers and lock up those who are criminally bad, they are derelict in their duty. Roads are Public Ways for the PUBLIC to use to move around the cabin. To tell a big segment of the public “you’d better not use those roads because drivers might run you over” is simply asinine. 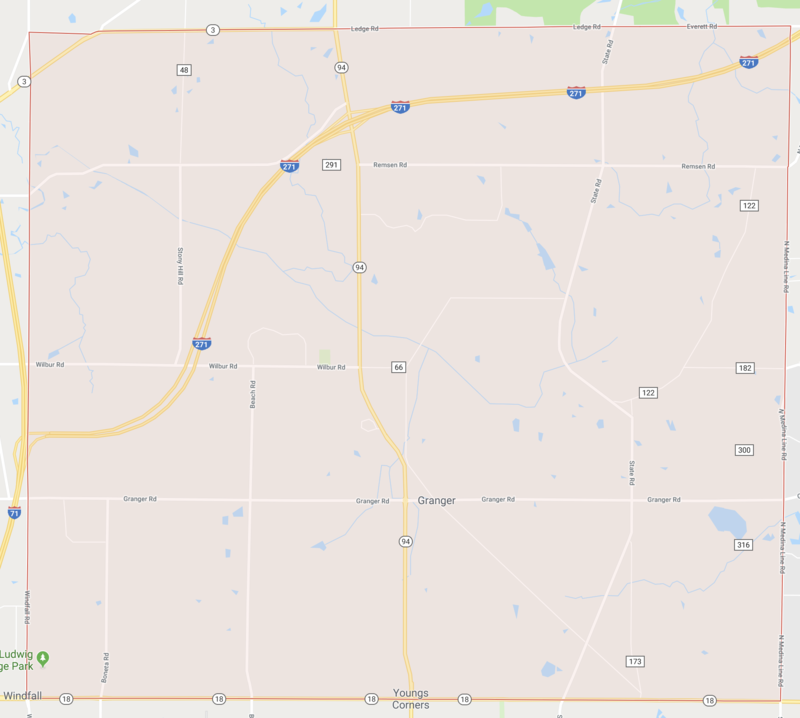 A further point relating to Ohio law is that most of the township roads, from what I can tell during a quick look on Google Maps, are your typical Ohio township roads… two lanes … narrow… with very few exceptions. “Narrow” roads and lanes present a unique opportunity to cyclists under the law. Ohio, like most states, has a “AFRAP” or “FTR” rule. [AFRAP meaning “As Far Right As Practicable” while FTR means “Far To The Right”]. The key provision is found in Ohio Revised Code Sec. 4511.55(A), which states a cyclist must operate a bicycle “… as near to the right side of the road as practicable...” whatever THAT means. That word, “practicable,” is undefined in the law. In fact, it appears over 200 times in the Revised Code as a way of expressing time, timing and distance or space and is undefined throughout the Code. For many years in my Bike Cases I would argue that “practicable” HAS to mean, at a minimum, “safe” and “reasonable” from the CYCLIST’s perspective. The legislature would never, I argued, mandate that a vehicle operator take a lane position that was unsafe or unreasonable. Finally, in 2006 the Ohio Bicycle Federation [OBF] prepared an extensive overhaul to Ohio’s bicycling laws and drafted what we called “The Better Bicycling Bill.” We found sponsors and helped push the bill along the rocky legislative path. Several of us testified in Columbus and were there on that crazy day when our 2:00 pm testimony was pushed back to 7:00 pm or so due to some totally unrelated political shenanigans. Ultimately, we testified, and the bill passed… UNANIMOUSLY… and went into law in September, 2006. This new provision gave cyclists a broad new right to WIDEN the road. 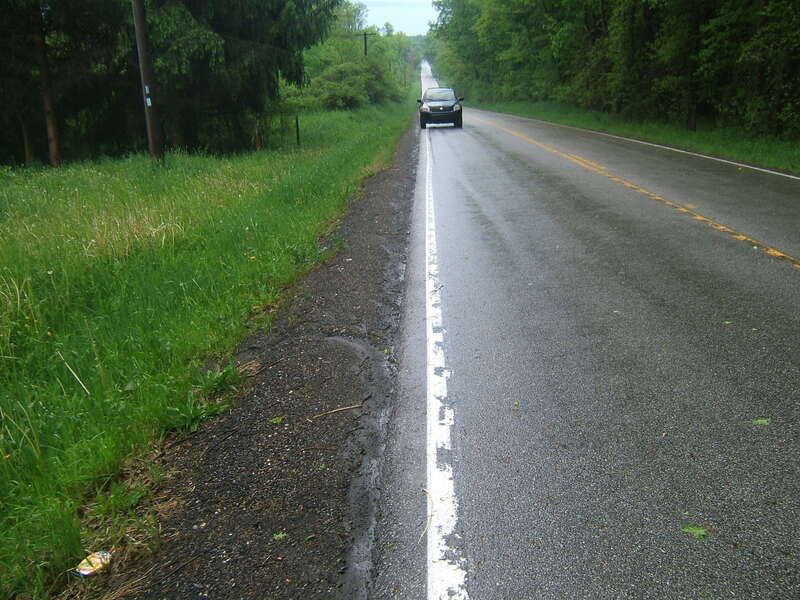 Just about EVERY township and county road in Ohio is “too narrow” to be safely shared. This means that the AFRAP rule does not apply to just about every county and township road in Ohio. 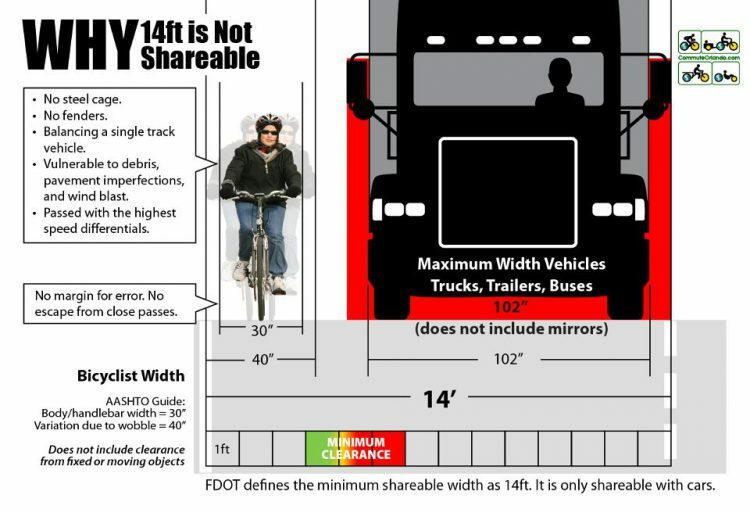 As this graphic by Keri Caffrey of Cycling Savvy depicts, even a lane as wide as fourteen feet is TOO NARROW to be shared by a cyclist with passing vehicles, side by side, within the lane. In many areas, unfortunately, police do not realize the impact of 4511.55(C) and will demand that cyclists become “gutter bunnies” and hug the white line. The cyclist has very good reasons for NOT wanting to be far right. First, hugging the white line sends a visual cue to cars and trucks coming up from behind that there just might be enough room to pass between the cyclist’s elbow and the white line. This sets up a very close, dangerous passing situation. Moving into the middle of the lane encourages those passing to change lanes to pass while providing the cyclist with space to the right if something goes wrong and the cyclist must make an evasive maneuver. Often, county & township roads have little or no berm/shoulder, and may have a steep drop or ditch or fence close to the edge of the roadway. Second, the cyclist who is out into the lane is far more “conspicuous” than the cyclist hugging the white line. The cyclist in the middle of lane is “perceived” by the motorist at a much greater distance, allowing the motorist more time to concoct a plan for getting around the cyclist safely. Third, the cyclist who is in the lane is more conspicuous to those coming towards the cyclist from the opposite direction who may be intending to turn across the cyclist’s path into a driveway or onto an intersecting road. Being more conspicuous allows the motorist to perceive the cyclist earlier in the game, and make better decisions about when to start the turn. Fourth, a lane position towards the middle of the lane makes the cyclist more conspicuous to those who may be pulling out of driveways or cross streets. So… back to Granger Township… WHAT is going on there? They do NOT understand the Bike Laws of Ohio. MAGAS MAKES THE WALL STREET JOURNAL! « Helmets and Helmet Laws- Should MOTORISTS Be Required to Wear Them?